New. Num Pages: 512 pages. BIC Classification: FA. Category: (G) General (US: Trade). Dimension: 134 x 202 x 34. Weight in Grams: 370. 2017. Reprint. Paperback.....We ship daily from our Bookshop. 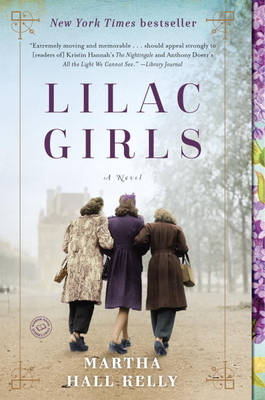 Lilac Girls by Martha Hall Kelly is a historical novel set during World War II. We get to see how the lives of three women in three different countries are affected by the war. Caroline Ferriday in New York City, Kasia Kuzmerick in Lublin, Poland, and Dr. Herta Oberheuser in Germany. This war will forever change their lives (if they make it alive to the end). Each one will experience the war differently. Come see how these three woman survive the war and what happens to them afterward. Lilac Girls is a long novel with some extreme details. This book is not for the faint of heart. There are many gruesome details about what happens at Ravensbruck (originally listed as rehabilitation camp for women). Ravensbruck was actually a concentration camp. Many women were experimented on at this camp by the doctors. These women became known as The Rabbits. It is very hard to read the details in this book. Lilac Girls contains good writing and interesting characters. The book starts out slow (making it hard to get into), but it does get much better. It is also confusing at first because it starts with Caroline (a New York socialite who devotes her time to the French Consulate), then goes to Kasia, then Herta. It then starts over again. The majority of the book is devoted to the what happens to the characters during the war and then the last section to how the war affects the rest of these women's lives. I give Lilac Girls 3.75 out of 5 stars. This novel will stick with you long after you finish it (because of the details). The book is based on real people and incidents. I received a complimentary copy of Lilac Girls from the publisher in exchange for an honest review of the novel.